Arguably the most beautiful sounding microphone ever produced, the Telefunken ELA M 251E has been featured on countless hits and classic recordings over the decades. By virtue of its smooth, yet present and “open” sonic character, the ELA M 251E large diaphragm tube microphone is a true classic with very few rivals. The Telefunken ELA M 251E includes an edge terminated, dual backplate CK12 capsule capable of cardioid, omnidirectional and bidirectional polar patterns, a New Old Stock 6072a vacuum tube and a Haufe 14:1 ratio output transformer. The Telefunken Elektroakustik reissue is 100% true in every detail to the original (the parts are interchangeable with the 50+ year old originals), and will deliver the same sonically opulent response that made the ELA M 251E one of the world’s most sought after recording tools. Arguably the most beautiful sounding microphone ever produced, the Telefunken ELA M 251E has been featured on countless hits and classic recordings over the decades. By virtue of its smooth, yet present and “open” sonic character, the ELA M 251E large diaphragm tube microphone is a true classic with very few rivals. Today, prime examples of vintage ELA M 250 / 251 (both "E" and "non E") microphones have become rare and highly sought after jewels, commanding tens of thousands of dollars on the vintage market. 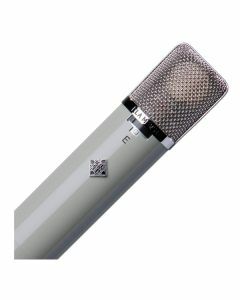 Telefunken Elektroakustik’s historic recreations of the ELA M 251E exemplify the best qualities of the finest specimens of these legendary beasts, and while more expensive than most modern microphones, they are true to the heritage of their 50+ year old brethren. The Telefunken ELA M 251E includes an edge terminated, dual backplate CK12 capsule capable of cardioid, omnidirectional and bidirectional polar patterns, a New Old Stock 6072a vacuum tube and a Haufe 14:1 ratio output transformer (the same found in the AKG Acoustics GmbH C12). Each reissue is 100% true in every detail to the original [the parts are interchangeable with the 50+ year old originals], and will deliver the same sonically opulent response that made the ELA M 251E one of the world’s most sought after recording tools.Each ELA M 251E microphone system comes complete with M950E power supply, M850E 25’ quad-shielded Accusound ACX-7 tube microphone cable, M750 elastic shock mount, FC50 locking flight case andWB50 wooden microphone box.